Sorry I've been MIA in blog land for almost a week!! 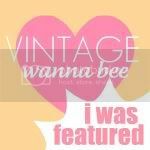 I've started up school again and my camera broke, so my blogging grove has been jumbled up. But, I'm back and have two adorable embroidery projects to share! The project originally came from the blog Freckled Nest. Head over there for a more in depth tutorial. Basically, all I did was arrange a cute pattern of buttons (the heart button came as a gift from Button Mad and all the others were flea market finds) and then drew out guide lines for their stems. I just used the most basic stitch which was a good idea for my first embroidery project!! Not super straight. Let's just say there is a slight breeze....I still think it turned out so cute! I started by free-hand drawing the stems and then stitched them using a chain stitch. I cut out a whole bunch of little circles made out of felt. And then stitched them on using a cross in the middle of each flower using yellow embroidery floss. And that was all! Easy peasy stuff, but looks so cute! I think I'm addicted to embroidery now!!! There will probably be more projects coming soon!! Super cute!! You did a great job! I love embroidery, too :) I have a few projects on my blog & I make patterns all the time. So fun!! So cute! It even looks easy enough for my unskilled self to try. They both look so sweet! Way to go, chick! Love them both! :) They are very cute! cute cute! I may have to try the bottom one! These are so cute. 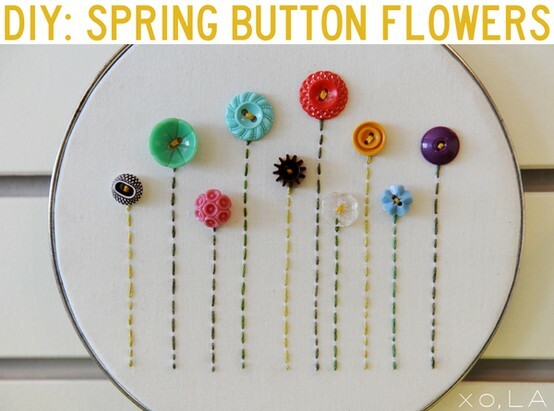 I also saw the button spring flowers and decided to try embroidering. It is also my new favorite thing :) I did a baby name thing but now I really want to try those flowers. They look beautiful! Ack! Those are just too stinkin' cute!! 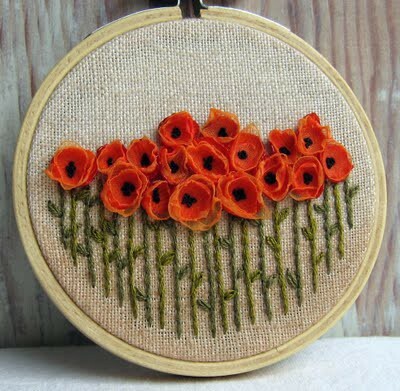 What a beautiful hoop, the one with the felt poppies!!! I love the colors! love them both! so cute. so cute! LOVE the felt flowers, and the buttons are adorable! *I just love buttons*. Aww these are so cute! They would look adorable in a little girl's bedroom! So sweet! These are so cute! Great job! And I'm glad you're back too! :) Have a great semester! LOVE!! I have wanted to learn how to embroider for so long! I have a gazillion of those hoops- maybe this can be my first attempt because they are SO CUTE!!! Hello, I’m Carmen from RoCa and Company and I would like to personally invite you to our new Rockin’ link party every Friday. I really like these embroidery ideas...I'm gonna have to copy this but embroider a denim bag or a shirt for my daughter. A very decent artwork with amazing contrasting color use in it. This showcase the class of embroidery digitizing. Your blog will contain good knowledge regarding towards the content and it really help. you did a great job. These are so cute! Really adorable and attractive photographs. And it is also quite informative post from where people can get new ideas for embroidery. Keep giving updates. I really liked your post and also liked your all photographs which are very attractive. People must get some deep information and some new themes for making beautiful embroidery design. Good post Rebecca. Nice to hear that embroidery digitizing is your favorite craft and how it became your favorite that is also acceptable after seeing the project on Pinterest. That image is really inspirational. keep it up the good work. Thanks.